"In the last century, almost one hundred of Scotland’s malt whisky distilleries have been closed or destroyed. This accounts for nearly half of all distilleries that have ever existed in Scotland. Global economic downturn, over-production, world wars and prohibition have all contributed to the loss of so many distilleries. As a result of all of these factors, many unique and venerable brands have been lost to the world. Until Now"
Part of a series, this is Lost Distillery's take on what Benachie Distillery's whisky might taste like today, had it not closed in 1913. It has a notably dark amber hue, and a bouquet that suggests toffee and campfire smoke. On the palate, it's a relatively dry sip, starting with toffee but unpacking slow-building smoke, clove and burnt orange peel, and finishing with cigar wrapper, unsweetened chocolate and spice. A good contemplative sipper. Best Buy. 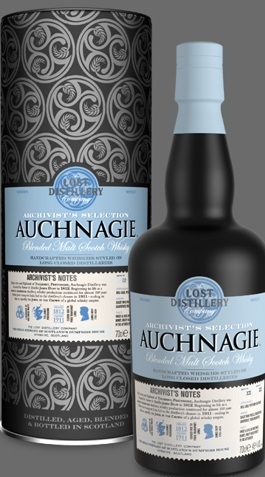 46% ABVHad Islay's Lossit Distillery not closed in 1867, this is Lost Distillery's interpretation of what the whisky might taste like today, part of a series. 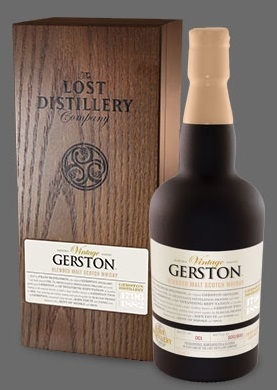 This golden Scotch has a peaty aroma, with a honeyed undercurrent. Notably smooth and silky on the palate, a medicinal, iodine note leads on the palate, followed by bold peat smoke and hints of BBQ-like mesquite. A faint citrus note plays on the smoky, peppery fade. A splash of water helps temper the lip--numbing alcohol heat. 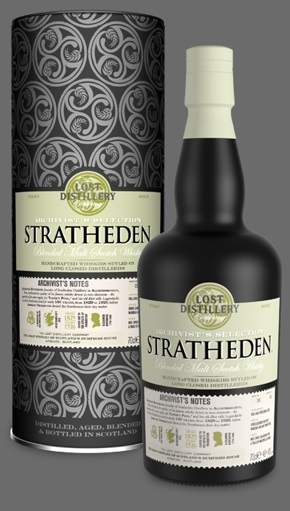 Had the Dufftown/Speyside Towiemore Distillery not closed in 1931, this is Lost Distillery's take on what the whiskey might taste like today, part of a series. 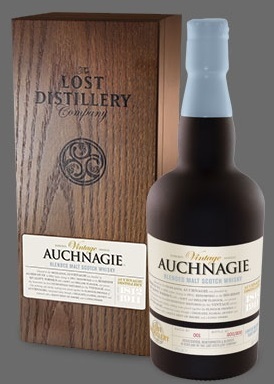 This blended Scotch has a copper penny hue and an aroma that intertwines light peat smoke with baked pear and tea. The palate shows cocoa, peat smoke, cigar wrapper and tea, finishing with clove sparks in a long, warm, smoky and chocolaty finish. Best Buy. Appearance: Full gold, with khaki lights. Thin but slow-running legs. Aroma: A dense, leathery nose with traces of dry fruit-cake, madeira cake and tinned pears, and a suspicion of scorched newspaper in the background. After a while a hint of pastry, hard toffee and sweet tobacco. A drop of water increases the pastry note, now buttery, and replaces the fruity notes with waxy green apple. Taste: Sweet and peppery to taste, at bottled strength, with a trace of salt and a warming, medium-length finish. Lingering heat. Similar profile with water, at reduced levels, but without the salt and warm finish. Taste: Smooth texture, sweet taste with smoke in the finish and a mineral twist. Water softens the texture; less sweet but still smoky, and a lingering smokiness in the aftertaste. Comment: The flavour profile is just what you would expect from a 19th Century distillery. Appearance: Dull gold, with very slight haze (suggesting lack of chill-filtration), and good thick legs (indicating good texture). Aroma: Slight nose prickle. The top notes are juicy and fruity – bruised pears, grapefruit, fresh orange peel. Behind this there is a light biscuit note (Rich Tea biscuit) and a trace of steam engine. A little water introduces estery pear drops, soft apples and oiled leather. Taste: Very sweet to taste at bottled strength, with considerable spice across the tongue and a warming, medium-length finish. Fruity boiled sweets in the aftertaste. At reduced strength it is less sweet and less spicy, but remains fruity, with a trace of vanilla sponge – Eve’s Pudding. Comment: Spicy and vigorous at full strength; soft and pleasant with a dash of water. Aroma: A relatively closed nose; clean and fresh, with traces of linen and herbal fabric freshener. Laura Ashley? After a while a light, spicy prickle emerges, topping a fruity/doughy note: apple dumpling, made with suet and dusted with nutmeg. With a drop of water the paper note advances, joined by warm leatherette and a trace of steam. Taste: Smooth texture, sweet taste and a surprising amount of smoke in the finish – more coal smoke/steam engine than peat smoke. An unusual, antique taste, which holds up well with a drop of water, although the smoky element is reduced. Comment: Interesting and vaguely ‘old fashioned’, especially without water. Appearance: Pale gold. Lemon lights. Aroma: Sweet malt in the foreground, rapidly followed by fruity notes – tinned pears – with traces of spun honey. The sweet cereal now in the background as sweet biscuit. Water introduces hemp rope and wet cardboard, but still with a fruity top-note. 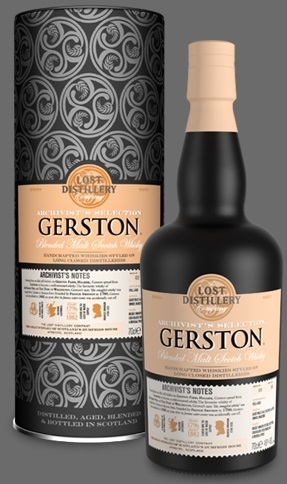 Taste: Sweet to taste at bottled strength, with considerable spice across the tongue and a warming, medium-length finish. At reduced strength it is less sweet and less spicy, but remains fruity, with a trace of apple sponge and vanilla. Comment: Pleasantly sweet and spicy, with the ‘hemp rope’ an old fashioned scent. Aroma: A dense, leathery nose to start, then dry fruit-cake, madeira cake (with Maraschino cherries) and tinned pears. After a while a hint of pastry, hard toffee and sweet tobacco. A drop of water introduces pastry made with lard and adds a brown-paper note to faint pears. Taste: Surprisingly sweet and peppery to taste, at bottled strength, with a trace of salt and a warming, medium-length finish. Lingering heat. Similar profile with water, at reduced levels, but with more fruit. Comment: Similar in style to the ‘non-vintage’ edition, but with greater complexity.